We would like to thank everyone who attended and especially the speakers who made our event what it was. Over the next few weeks we will be uploading some recording of the event, our recording of the first day failed, so we are sorry we cannot bring you that. but we do have the rest. A month later and the UK still seems to be in Limbo, there has been a seismic shift in UK Politics, and most of the nation are attempting to find their feet. This workshop aimed to test two strands of political economy theory against the turbulence of the background to and sequel to the referendum. Speakers agreed that the referendum and its outcome provided no solution to the Economic and political crisis of British capital and the broader problems of the world economy. Bob Jessop’s strategic relational approach to understanding the state was contrasted with conventional approaches which saw the state as a machine or a subject. Instead the SRA sees the state as an ensemble of social relations between contending factions of the ruling class and opponents. This fitted well with the current conjuncture. Ngai-Ling Sum’s Cultural Political Economy tied in with this approach by analysing how different economic discourses are developed and how some are selected over others to govern political practice depending on the balance of social forces. George Kerevan traced the history of the British political elite’s frequently ambivalent relationship with the EU and forerunner, EEC. He placed this in the context of struggles around how best to solve the problems of British capitalism – the need for markets and economies of scale but low investment, poor productivity and profitability. Brian Parkin focused on the political economy of possibility, showing how innovations around alternative energy and new uses of hydrocarbons with low emissions offered the basis of an alternative economic strategy. Neil Davidson showed how ideas of nation and nationalism develop in tandem with the evolution of the capitalist state. Nationalism becomes the ideology of choice of the capitalist state but is contested by the political left. Neoliberal economic discourse was examined in detail. Any legitimacy of ideas it had were being replaced by increasingly coercive social policies. However there were opportunities for progressive politics in the uncertain turbulence brought about by the referendum outcome and the ongoing problems of British capitalism and fractures in the social relations of the state. This entry was posted in Events and tagged 2016Workshop. On Thursday the 8th of September at 3pm in The Chaplaincy, 25 High Street. Come along for an afternoon full of food and fun! Get to know your fellow students, their national cuisines and Aberdeen Political Economy Group’s activities and aims. All you need to bring is yourself and some food to share! Day 1, Friday 24th June. Day one will set the scene. Immediate reactions to the referendum will be followed by an opening session on the importance of theory in understanding the state. The workshop will therefore begin with an immediate reaction to the outcome of the referendum which will provide a background set of political and economic issues and practical implications against which an opening analysis of state theory can be developed. Initial reaction: commentary and discussion. A series of short initial assessments from different perspectives on the constitutional and political issues emerging from the referendum and implications for the British State, Scotland and the EU from speakers, to be followed by questions from participants and discussion. An open discussion on state theory in the context of the EU referendum result. Day 2, Saturday 25th June. Today will begin with a reprise by George Kerevan, journalist, political economist and MP of the referendum outcome and the main issues and challenges confronting the British and Scottish economies in which the state is implicated followed by a case study of energy, the environment and the state. Discussion will then continue on the theme which ended Day 1 of exploring how theoretical work on capitalism, power and the state can assist us in understanding these issues. Finally a second panel discussion will conclude the workshop, bringing the theoretical expositions and empirical issues together in a final discussion focusing on practical political implications. This session will include all the speakers and address issues emerging from Day 1 and those which arise during day 2. With the results of the referendum now 24 hours old and opinion flooding in, this session will review reactions and reflect on the challenges facing British capitalism, the European Union and the state. Oil, energy and the environment are never far from the economic agenda in Scotland and Aberdeen in particular. This session will address the implications of the European debate for energy policy and the prospects for and obstacles to a green energy led industrial renaissance. 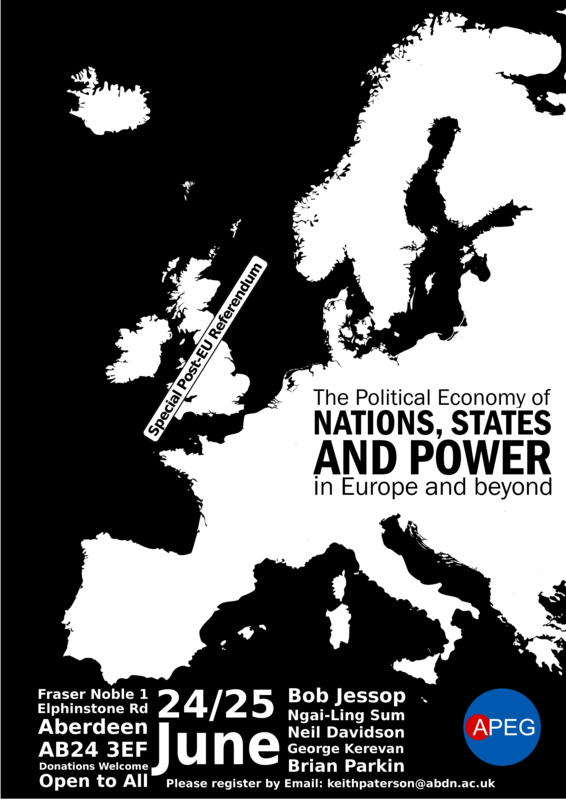 Session 5 – The State, Economy, Power and Political Practice. This final panel discussion with contributions from participants will respond to issues raised during the two days with a focus on applying the theoretical framework on power and the state to derive practical interventions. The referendum debate has thrown up key issues of state, nation and the economy. Few discussions on the critical issues facing the people of Scotland and the UK far less Europe, and other developed and developing countries in the world economy can proceed far before the issues of power and the state emerge. But what is the state and what is its relationship to other centres of power, regional blocs such as the EU and to the issues of money, finance and capital accumulation? How did the state and the system of nation states emerge, and how are we to understand the role of the state in contemporary capitalism? Much globalization discourse questioned whether the individual national (territorial) state would survive tendencies for the internationalization of production and exchange and the emergence of regional trading agreements. The financial crisis that began in 2007, however, showed how central the state is to capitalism through the many rescue packages of endangered banks and other financial institutions by central banks, states or international financial bodies dominated by major states. With economic recovery following the crash of 2007 at best weak and against the backcloth of the referendum result, this workshop addresses the key economic issues of today with a focus on the critical role played by the state. After critically reviewing the implications of the referendum outcome, speakers will examine in detail alternative perspectives on power and the state and the history and trajectory of the system of nation states from a political economy framework. Local speakers from politics/IR/sociology/business school to be confirmed. Ngai-Ling Sum: Is Reader in Cultural Political Economy at the Department: Politics, Philosophy and Religion at Lancaster University. Her interests centre on the regulation approach in political economy, international political economy, and the challenges of post-structuralism. She has a particular interest in developing a ‘cultural political economy’ that combines the ‘cultural turn’ and the study of ‘political economy’ considered both as a set of methods and as a field of study. Together with Bob Jessop she is a co-director of the Cultural Political Economy Research Centre with whom she also co-authored the much acclaimed book, Towards a cultural political economy: putting culture in its place in political economy. More recently, Ngai-ling has been working on global governance, transnational business governance, corporate social responsibility and the cultural political economy of competitiveness. Bob Jessop: Has published extensively on state theory, the financial crisis and political economy. He is currently Distinguished Professor of Sociology at the University of Lancaster. Bob is co-director of the Cultural Political Economy Research Centre and co-author with Ngai-Ling Sum of Towards a cultural political economy: putting culture in its place in political economy. His new book, The State: Past, Present, Future was published in 2015 and he has co-edited a recent book on the cultural political economy of the financial crisis: Financial Cultures and Crisis Dynamics (Routledge Frontiers of Political Economy). Neil Davidson: Worked as a state manager for the Scottish Government and its predecessors for over twenty years, but now lectures in sociology with the School of Political and Social Science at the University of Glasgow. He is the author of The Origins of Scottish Nationhood (2000), Discovering the Scottish Revolution (2003), for which he was awarded the Deutscher Prize, How Revolutionary Were the Bourgeois Revolutions? (2012). Holding Fast to an Image of the Past (2014), We Cannot Escape History (2015) and Nation-States: Consciousness and Competition (2016). Goerge Kerevan: Is a Scottish journalist, economist and Scottish National Party (SNP) politician. He has been the Member of Parliament (MP) for East Lothian since May 2015 and is a member of the House of Commons Treasury Select Committee. George was Associate Editor of The Scotsman newspaper for nine years and now writes a weekly column for The National. Goerge Studied political economy at Glasgow University. For 25 years he lectured on economics at Edinburgh’s Napier University, where he specialised in energy and the Scottish economy. During the referendum campaign he co-authored a book with Alan Cochrane, Scottish editor of the Daily Telegraph, in which he put the case for independence, with Cochrane arguing for the Union. Brian Parkin: Originally a design engineer, he became an energy economist before joining the National Union of Mineworkers as a Research Officer in 1987. This position involved the detailed analysis of energy privatisations and the economics of nuclear power and resulted in appearances before Commons Select committees as well as EU Energy Directorate consultations. Dr Parkin is a Research Fellow at the University of Leeds and he is presently engaged in the initial stages of radical energy, environmental and diversification strategies in Scotland. RIC & Stop TTIP Aberdeen will be hosting an event. 19:00, This Firday, 13th May @ the Aberdeen Arts Centre on King Street. Regardless of which side of the debate you end up on, I believe it is an important debate to have. Like the Scottish Referendum, this outcome will have implications for the future of the UK, Europe – and given the way the US seems to be weighing in on this discussion – the wider world. we also have Neil Davidson who will also be speaking at our june workshop. This entry was posted in Events, Other Events of Interst. The UK economy is likely to be the terrain on which tensions will emerge between an emboldened austerity-­‐driven Conservative government unexpectedly elected with a small but clear overall majority, and a triumphant Scottish National Party committed to oppose public spending cuts. The Aberdeen Political Economy Group (APEG) and the International Initiative for Promoting Political Economy (IIPPE) are therefore pleased to announce this timely two-­‐day workshop supported by the Radical Independence Campaign in Aberdeen. The workshop aims to address fundamental questions relating to the nature of money and the role of finance in contemporary capitalism and how they impact specifically in relation to Scotland and the rest of the UK. The outbreak of the financial crisis in 2007 has been followed by a resurgence of interest in political economy as mainstream economic theory has proven inadequate as a framework for understanding and explaining the crisis. Arguably mainstream approaches have also underpinned the politics of neoliberalism and provided the logic for some of the highly questionable financial models and practices of banks and financial institutions in the run up to the banking collapse. In Scotland, the referendum campaign and the general election have raised a number of issues on finance, debt and currency on which political economy has much to say. In fact, the aftermath of the referendum has massively re-­‐invigorated radical politics in Scotland and there has been a renewed interest in economic ideas and political activity around the need for progressive social change. The immediate result of this has been a surge in interest in learning more about political economy in relation to the Scottish economy. This workshop brings to Aberdeen, for the first time, a panel of expert speakers who work on the political economy of capitalism from the perspective of its contradictions and conflicts. A critical evaluation of the monetary system, the pivotal role of finance in capitalist crisis, and the impact of neoliberal politics and austerity economics are at the heart of this workshop, which will be of interest to a wide audience both in the academic world and the wider progressive political community in Scotland and the rest of the UK. Simon Mohun: is Emeritus Professor of Political Economy, Queen Mary University. Simon’s research interests are primarily concerned with the theoretically informed measurement, description and explanation of trends in aggregate profitability in developed capitalist economies since the 1960s. He has written extensively on rates of profit and productive and unproductive labour in capitalist societies. Joseph Choonara is currently undertaking research for a PhD on the restructuring of the working class in Britain at Middlesex University. He is the author of Unraveling Capitalism: A Guide to Marxist Political Economy (Bookmarks, 2009) and a member of the editorial board of International Socialism. James Foley is currently completing his PhD on the Sociology of the Scottish economy since 1971 and will speak on ‘From Finance Capital to Financialization in Scotland’. He is co-­‐author of ‘Yes: the Radical Case for Scottish Independence’ Pluto Press. James Meadway is Senior Economist at the New Economics Foundation where he leads their work on responses to austerity and the crisis, and in developing macroeconomic alternatives. He has previously worked as a policy advisor at HM Treasury, and senior policy advisor at the Royal Society. He speaks and writes regularly on austerity, financialisation and the Scottish economy. Neil Davidsonlectures in Sociology at the University of Glasgow. A former Deutscher Memorial Prize winner (2003), he has written extensively on the bourgeois revolution and the transition from feudalism to capitalism, on uneven and combined development, on nation-­‐states and nationalism, and on the history, content and impact of neoliberalism. He is particularly interested in how these themes relate to Scotland. His latest book is We Cannot Escape History (Chicago: Haymarket Books, 2015). Financialisation and the Political Economy of Money and Finance ‐ Simon Mohun, John Weeks and Joseph Choonara. Simon will introduce the workshop by providing a theoretical framework for understanding the complexities of contemporary capitalism. He will outline what is distinctive and original about Marx’s method, the centrality of the labour theory of value for explaining the nature of exploitation and the source of profit and the distinction between productive and unproductive labour in a capitalist context. Expanding on the framework established in the first session, Simon will discuss the origins, forms and functions of money, the emergence of money capital and the development of credit and its role in facilitating the circuit of capital. He will show how the potential for crisis is embedded in the very nature of capital and set the scene for the next two sessions by discussing the rate of interest and the topicality of Marx’s concept of fictitious capital for understanding financial bubbles. John Weeks will deepen the analysis introduced by Simon when considering money, credit (such as interest bearing capital and fictitious capital), speculation and crisis. He will then show how financial instability and other crisis tendencies combine and interact in contemporary capitalism. This analysis will then be applied to how governments have responded to the crisis, the contradictions of austerity economics and the post election dilemmas facing the Conservative government. Financialisation is a concept that has emerged in the last decade to describe the increasing importance of financial markets, financial motives, financial institutions, and financial elites in the operation of the economy, from the day‐to-day experiences of families to the governing institutions of capitalism at national and international level. Joseph Choonara will discuss the meaning and application of this concept while outlining the relevance of contrasting theories of financialization to understanding the nature of capitalism in the twenty-­first century and how these relate to explanations of the crisis. Money, Finance, Neoliberalism and the Crisis in UK and Scotland – James Foley, James Meadway and Neil Davidson. • The period since 2008 has been marked by the complete failure of a return to ‘normality’ across the developed world. For the UK, whilst interest rates remain wedged at record lows and asset prices balloon, real wages have scarcely recovered, measured productivity has flat-lined and the current account deficit is at record levels. This paper places the conjunction of multiple, long-term problems in the context of the UK’s deep political crisis, and examines the consequences for the unitary UK state. • Neil will address the extent to which neoliberalism may now be acting as an impediment to long-term accumulation strategies for capital, partly by eroding the capacity of nation-states to represent the collective interests of capital, and partly through the importation of the kind of short-termism typical of financial capital into the behaviour of mainstream politicians. This entry was posted in Events and tagged 2015Workshop.